For over 76 years, George Kent (Malaysia) Berhad has been a leading engineering company in Malaysia specializing in M & E products and services to a number of industries such as the water, process, flow and building. Its core areas of businesses are centered in manufacturing, water infrastructure projects, trading and construction. Its infrastructure investment and water business units have wide experience in turnkey contracting and project management for the construction, upgrading, rehabilitation and expansion of water treatment plants and related facilities such as raw water intake plants, pumping station, power generating plants and privatization of water utility companies. Its service capabilities include providing operations & maintenance (O&M) services, telemetry systems and services, building automation/management system (BMS) and building security system (BSS) for buildings and water treatment plants. Its construction unit has recently completed the Kuala Lipis hospital expansion project and currently undertaking the Phase II works. 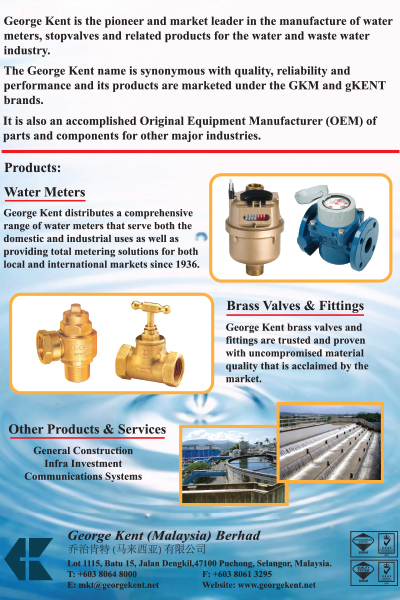 George Kent’s has the largest brass-forging plant in the region and produces an extensive range of water meters and related fittings for the domestic, commercial and industrial markets. It is also an OEM supplier for other non-ferrous products for other industries both locally and abroad. Its trading unit specializes in a range of products and services catering to the water, process, and flow building industries that include water meters and metering solutions, other non-meters products and instrumentations. George Kent products are synonymous with quality and is the market leader in Malaysia and being exported to more than 20 countries worldwide that include the ASEAN countries, Hong Kong, South Africa, Australia, England, Middle East, Africa, Papua New Guinea, Kenya, Fiji, etc.